Meath meet Tipperary in the opening round of the NFL Division 2 on January 27th in Paitrc Tailteann. The Munster men have held the upper hand in recent years that included that four point win over a Davy Dalton trained Royals in the 2011 All Ireland MFC quarter final. The Premier boys went on to defeat Dublin in the All Ireland final. Many of these player will cross paths again on the last Sunday of the month. Munster champions Tipperary set up a semi-final meeting with Roscommon after they grabbed five of the last seven points to see off Meath in yesterday's All-Ireland MFC quarter-final at O'Moore Park. Tipp's meeting with Roscommon will be a repeat of the 1984 semi-final which they won before losing to Dublin in the final. And there is a possibility that the same two counties could meet in this year's decider with Dublin facing Galway in the other semi-final. Full back John Meagher and full forward Michael Quinlivan were both outstanding for the Premier County, with Quinlivan top-scoring with 0-4. The sides were level five times until Quinlivan inspired Tipp's late rally. Bobby O'Brien opened the scoring for the Royals after three minutes before Philip Quirke levelled five minutes later. The sides were level on 0-3 apiece at half-time, though Meath were unlucky not to be ahead after Ratoath clubman O'Brien saw his goal attempt hit the post in the 11th minute. There was still nothing to separate the teams until quick points from wing back Colin O'Riordan, Stephen O'Brien and Bill Maher pushed Tipp into a 0-8 to 0-5 lead. Meath replied with scores from Bryan McMahon and Anthony Forde, but they couldn't get back onto level terms and Tipp pulled away in the closing stages, with Quinlivan accounting for two of their last three scores. 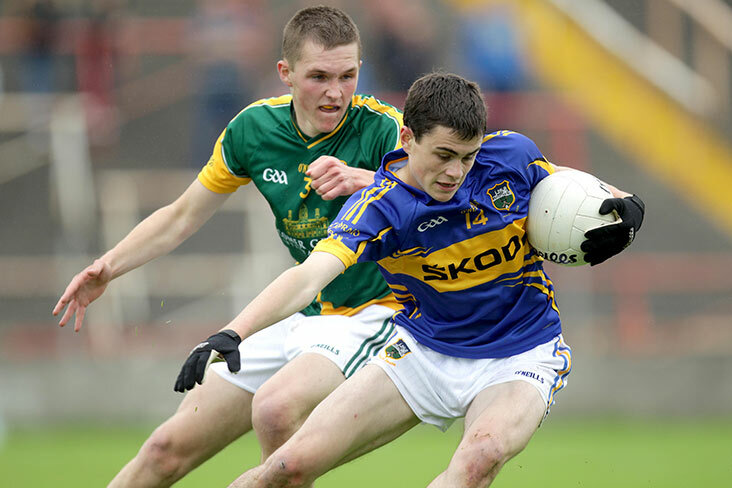 Tipperary - G Slattery; N Sullivan, J Meagher, C O'Sullivan; C O'Riordan (0-1), D Fitzelle (0-1), S Kennedy; S O'Brien (0-1), I Fahey (0-1, f); B Maher (0-1), P Quirke (0-2, 2f0, G Henry; L McGrath, M Quinlivan (0-4, 2f), J McGrath. Subs - J Lonergan for Henry, TJ Ryan for Fahey, J Martin for Quinlivan. Meath - R Burlington; C Finn, C McGill, O Fitzpatrick; S Melia, S McEntee, A Forde (0-1); P Harnan, A Flanagan; O Sheridan (0-1), B O'Brien (0-1), S Sheridan; B McMahon (0-4, 3f), C O'Sullivan, W McGrath. Subs - E Wallace for S Sheridan, C Sheridan for McEntee, D Smyth for C Sheridan, R Gore for McGill, R Farrelly for McGrath. Ref - B Cassidy (Derry).